POLITICAL INSIDER: Who will succeed Jerry Brown? FRESNO, Calif. (KFSN) -- Welcome to 2018 - a huge political year in California and the rest of the country - and get ready. We are only six months away from the June Primary in California. The most high-profile race in the Golden State this year will be for Governor. Who will take over the Governor's Office from Jerry Brown who is now in the final year -- of his final term. A new and exclusive ABC30 Action News Poll conducted by Survey USA gives us an early snapshot of the frontrunners for the open Governor's seat. The results show a three-person race so far to win the top two spots in the Primary and move on to the November General Election. Remember, the candidates finishing first and second in the Primary - regardless of political party - square off in November. Lieutenant Governor and former San Francisco Mayor Gavin Newsom has a nearly two-to-one lead over his closest competitor, former Los Angeles Mayor Antonio Villaraigosa. Both are Democrats. Coming in third in the poll is Assemblyman Travis Allen, a Republican from Huntington Beach. 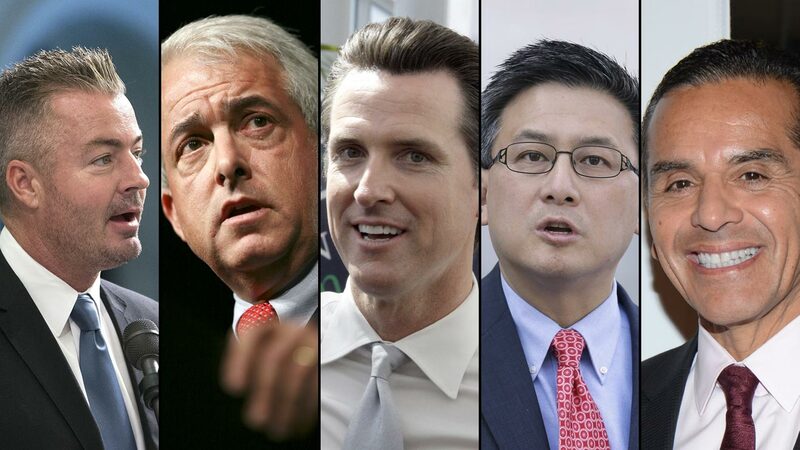 Democratic State Treasurer John Chiang is fourth and Republican businessman John Cox is fifth. FILE - Los Angeles Mayor Antonio Villaraigosa stands for a photo in his office in Los Angeles. The rest of the nearly 50 other possible and declared candidates in the poll including former Fresno Mayor Ashley Swearengin - who says she is not running - earned 2% or less. 29% of the 506 "Likely Primary Voters" responding in the poll are "undecided". The results of our exclusive poll should be encouraging to Allen's campaign. Many political watchers believe the two Democrats will move on to November because of California's heavy Democratic voter registration, but the Republican could make it more than interesting for the number two spot. Allen is by far, the GOP choice of Central Valley "Likely Voters" in the Governor's poll. He and Newsom both get 20% ... that's far in front of the others. The candidates know the Valley could make or break their campaigns. We've already had campaign stops or appearances in Fresno from all five of the top candidates in the poll. What about the man they hope to replace? Half of the 909 Registered Voters in the statewide poll like Jerry Brown's job performance. Survey USA asked, "Do you approve or disapprove of the job Jerry Brown is doing as Governor?" In the Central Valley, 40% of those responding "Approve" of Brown's job performance, 42% "Disapprove", and 17% responded, "Not Sure." Brown is now in his 16th year as Governor. He also served two four year terms in the 1970's and '80's. Brown is California's longest serving Governor. This new Action News Poll conducted by Survey USA covers a variety of issues from sexual harassment and the border wall ... to potential election match-ups between President Trump and Oprah Winfrey, Tom Hanks, and others.